The HSC is ready to meet the HoR in Tobruk (Photo: HSC). 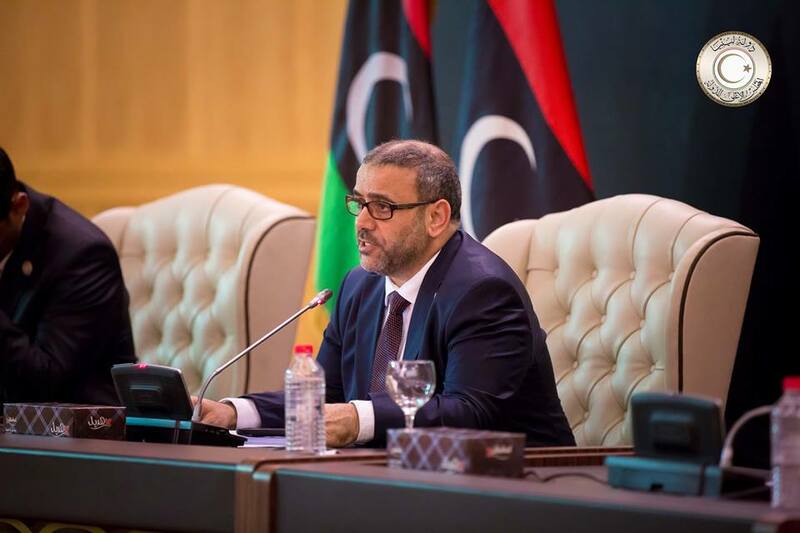 The High State Council (HSC), under its new leader Khaled Mishri, has issued a reconciliatory statement to the House of Representatives (HoR) offering to meet in Tobruk in order to break Libya’s current political stalemate. Referring to last week’s meeting in the Moroccan capital Rabat with HoR head Ageela Saleh, the HSC 7-point statement (dated 30 April but released yesterday), welcomed any direct meeting with HoR. The statement confirmed the HSC’s readiness to reconfigure the executive into a Presidency Council of one head and two deputies (the 2+1 formula), with a separate government. The HSC said it looked forward to the positive response of the HoR to ‘‘end division and to the unification of state institutions’’. The HSC also said that it was ready to start appointing or relieving from posts holders of leadership positions in sovereign posts as per article 15 of the Libyan Political Agreement (LPA). It also called on all relevant institutions to urgently solve the financial crisis and to take political and economic measures and start implementing them without delay. It added that it will not hesitate in taking the action as contained within the LPA in taking steps forward to achieve financial and economic reform in order to relieve the burden that as exhausted citizens. The HSC re-confirmed its support for the unification of the military institution under civilian control and distancing it from political infighting, to enable it to play its designed role. The HSC also renewed its call on the HoR to activate article 23 of the LPA to reach accord over the referendum law so that the Libyan public can say its word over the draft constitution produced by the Constitutional Drafting Assembly. The HSC stated that it was ready to accept any invitation by the HoR to meet in Tobruk in order to get past the (transitional) phase and in order to reach a new phase based on brotherhood, reconciliation, comprehensive amnesty, and the insurance the return of the displaced and prioritizing the high state interest. The HSC called on all media to follow professionalism in their work and to take on a narrative of forgiveness, plurality, on-exclusion and end incitement and the language of hate. It will be recalled that Mishri had announced that sessions would be held by both bodies next week to discuss the outcome of the Morocco talks between HoR head Ageela Saleh and HSC head Khaled Mishri. There has been no confirmation of this from official HoR sources. The official HoR Spokesperson Abdalla Belheeg had announced last Saturday that Saleh would be on an official visit to Morocco on Sunday as a result of an invitation to him from Habib Malki, the head of the Moroccan House of Representatives to discuss the strengthening of bilateral relations between the two countries. And although local Libyan social and regular media has been reporting on the alleged outcome of the meeting – no official source has confirmed or denied the contradictory reported news of the results of the meeting. Mishri’s revelation that he and Saleh will report to their respective entities means that they prefer to inform their political bodies of the details first, prior to releasing the news to the general public. This may suggest that some compromise was reached, which would need the approval of the two respective political bodies, as well as that of the returning Hafter.